Congratulations, you’re having a baby! You might be getting a little nervous about what will happen after you have your bundle of joy. To help relieve some of the stress try preparing for some of the changes now. Follow this short checklist and the more you accomplish before bringing your baby home from the hospital, the easier the change will be. Prepare big brother/sister for their new sibling. Let them know about the things that will be changing and what to expect when you bring your new baby home. Tell them that just like when they were younger, this new baby is going to need to be held a lot and given lots of attention. Show them some of their own baby pictures and let them know they get to be a role model for their new baby brother or sister. Maybe even give them a role, like making sure everyone that wants to hold the new baby needs to use hand sanitizer. You can bet no one is coming near your baby without clean hands if your little one is in charge. Check out our blog post about getting kids excited about becoming big brothers and big sisters. Prep your pup. They’ve been loyal and now they get to meet a new addition to the family. But all this excitement can be a lot for a dog, so ease them into it. Ask a friend or family member to bring one of your baby’s onesies home while you are still in the hospital. Letting your dog get familiar with your baby’s scent will take away the surprise once you actually bring the baby home. And although they make great pets, they don’t make great babysitters. Don’t leave your pet alone with your newborn, even if it’s only for a few minutes. Pack your hospital bag. This may seem obvious, but be sure to pack what mom needs and what your baby will need, including your baby’s special outfit for coming home for the first time. And don’t forget about you, you don’t want to get to the hospital and realize you didn’t bring your favorite sweatshirt! Safety first! Be sure your car is safe. You will need a car seat to bring your baby home. Get your car seat and set it up in the car ahead of time so you have one less thing to worry about. Many local fire departments will also check your car seat for safety too. Study up on all things baby. Read up on baby related topics like Tummy Time and milestones and also what to expect during your baby’s first few weeks at home. Being prepared is good but remember, every child is different. Some things will just take time for you to learn about your baby. Meal prep for the transition. Meal prep may already be part of your weekly routine, but kick it into overdrive before baby arrives. Try to have meals in the freezer that are ready to go for when your newborn first comes home. Things may feel hectic at first, but having a home cooked meal without having to spend a lot of time cooking will help you out! Find a doctor. Get references and decide on a pediatrician or healthcare provider before your baby is born. Having this decision made means one less task to worry about. Once your baby is born, you can schedule visits and not have to worry or spend valuable time researching, since you will have already picked one. One less thing to worry about! Accept help when it’s offered! Often friends and family members will offer to help by cooking you some meals or cleaning your house while you’re at the hospital. Let them! Building these support networks and getting into the habit of accepting and asking for help when you need it will be beneficial for when baby comes home and you (understandably!) need a break. It’s normal to be nervous about bringing your baby home from the hospital, but by completing this list ahead of time, you can help reduce some of the stress. Using these tips will help make the transition a little easier on everyone. 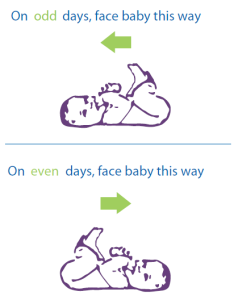 So remember, prepping for your baby’s arrival will help later on. Want more information on baby’s development? Have you started Tummy Time yet? Find out why Tummy Time is so important for baby’s development. Learn the ABC’s of safe sleep and other helpful tips!